"Bell Lodge" in Thorpeness, on the Suffolk coast is holiday cottage sleeping 6 people in 2 bedrooms. A lovely holiday cottage to spend a few days, and to enjoy the delights of Thorpeness and Aldeburgh. Bell Lodge is a 3 storey house which sleeps 6 people in 2 bedrooms, with the bedrooms being made up of a double bedroom and a twin bedroom. The twin bedroom also has a double sofa bed. Bell Lodge has a living room with a TV and DVD player - and as the living room is on the first floor, you have French doors to a balcony. The kitchen has an electric cooker, microwave, fridge/freezer, dish washer and a washer/dryer. Bell Lodge has Wi-Fi, which is vitally important for all those with children in tow. Your towels and bed linen are included too. Bell Lodge has a balcony with garden furniture, and parking for two cars. You are a short walk from the beach, and to Thorpeness's centre - although don't expect some large metropolis; there is a shop, pub and restaurant in Thorpeness though. And the Meare - you don't have to enjoy all things nautical to try this large boating lake. Should be holidaying in the summer months, you can take a dip in the sea, and make the most of the sand and shingle beach. Or, if you are visiting Suffolk during the colder months, you can take some head-clearing walks along the coast. 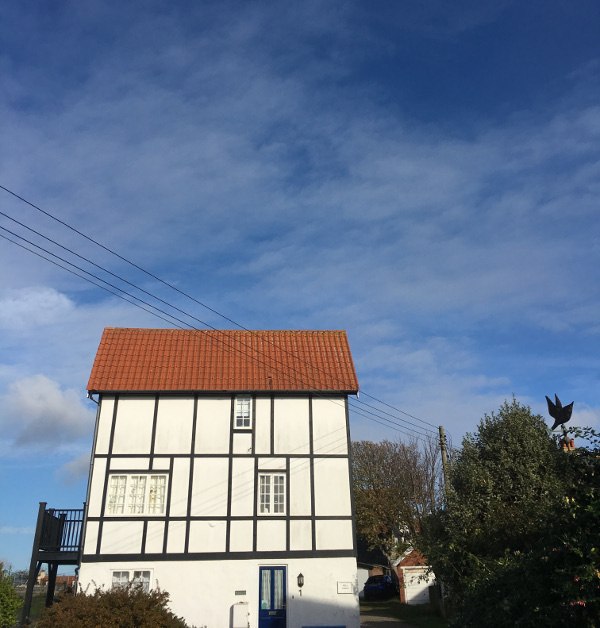 We visited Aldeburgh and Thorpeness recently (the video below was taken by us on our autumnal stroll), and walked from Thorpeness to Aldeburgh. Aldburgh has a larger choice of shops, pubs and restaurants - and a couple of world famous (nearly) fish and chip shops. You can always purchase some of the local catch directly from the fishermen, and have fresh Suffolk caught fish for tea. Venturing further into Suffolk, you can spend a couple of hours looking round the independent shops at Snape Maltings. Or head up the coast to Southwold. Southwold is the home of Adnams brewery, with plenty of pubs selling the local brew; Southwold also has a thriving town centre, and more costal walks should you fancy a chance of scenery from Thorpeness. The video below includes a few bits from our recent walk along the Thorpeness Coast. Should Bell Lodge not be to your liking, but you fancy staying in the area around Suffolk, you might well be interested in the cottages below. All these cottages are within a few miles of Bell Lodge.